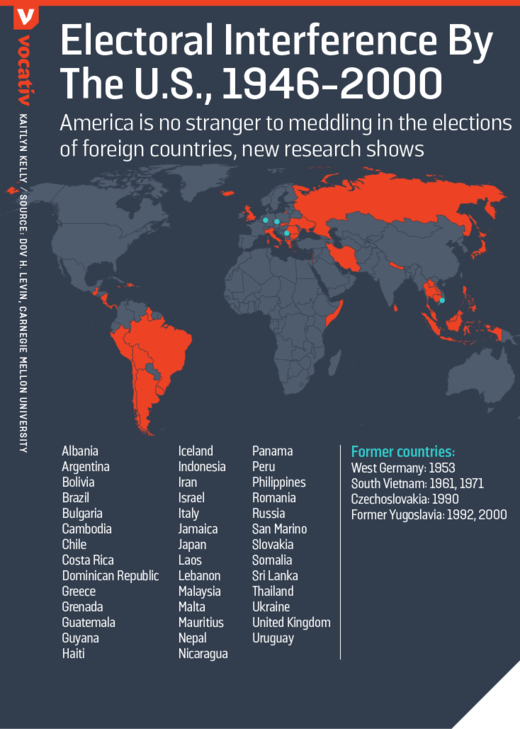 As the Trump-Russia collusion conspiracy theory has, via lack of evidence, all but withered away, it is time to set the record straight on Russia’s involvement in the 2016 election. What many dramatically refer to as an attack on our democracy or even an act of war was actually closer to a non-event that US foreign policy is to blame for. Instead of fear, anger, or hostility, we should react to Russia’s alleged involvement in the 2016 election with empathy, pity, and national self-reflection. In an ideal world, the Kremlin and the US federal government would be mutually respectful allies, and American and Russian people would engage in commerce with each other freely. But we do not live in an ideal world. We live in a world in which choices made by contemporary governments and individuals as well those made in the past (along with circumstances outside of anyone’s control) have inculcated Americans and Russians with different languages, cultures, values, and fears. Because of this, it may be impossible for the US and Russia to ever eliminate hostilities wholesale and create a live-and-let-live type of atmosphere. Even so, I feel that a Washingtonian/Jeffersonian foreign policy is our best and safest bet. Instead of getting caught up in entangling alliances, we should seek to make the best of an imperfect world by accepting countries for what they are and allowing their and our people to seek legitimate and independent roads to happiness and prosperity when they see fit. The counter to this claim could be that the consequences of the US and its NATO allies easing up would be ever worse. One might say that the only reason Russia has been so meek in its hostilities is because of the current robust military presence. On hacking, I am not convinced that the Russians are responsible. As the race in the Democratic Party between Hillary Clinton and Bernie Sanders was extremely divisive and contentious, it would be unsurprising to find out that various pro-Bernie members of the DNC with access to various servers decided to leak damaging documents about Clinton and her campaign. The motivation makes sense, and so do the logistics. It would have been far easier to get inside and download files at close proximity than from Russia (or, for that matter, Romania). This forensic evidence combined with Occam’s Razor makes it difficult for me accept the accusation of Russian hacking at all, no matter how many US intelligence agencies say otherwise. I am not saying that the Seth Rich conspiracy theory is likely to be true, but I find it equally as persuasive as the Russian hacking theory. The indictments of the Russian operatives accused of hacking the DNC server will not result in extradition or trial, so the accusations will never be tested in a court of law. And some of the most fundamental pillars of reason, liberty, and the Bill of Rights dictate that we cannot accept claims ad verecundiam. In fact, it is assertions from those in power, like the FBI and NSA, we must cast the most doubt upon. The indicted Russians are not guilty until proven guilty beyond a reasonable doubt. It would be nice to have civil libertarian organization like the ACLU actively reminding us of these things, but identity politics and Trump hatred have resulted in many such groups losing their way. Bringing these facts to light in the current climate can result in accusations of treason as Senator Rand Paul has been subjected to. While this is to be expected when it comes to warmongering neoconservatives, hearing it from self-described Liberals has a chilling effect. This sort of with-us-or-against-us, pseudo-Patriotism is far more reminiscent of Nazism than the enforcement of immigration law. And even without juxtaposing the amounts spent to influence the election, there is no scientific proof that voters can be persuaded via campaign contact or advertisements in the first place. 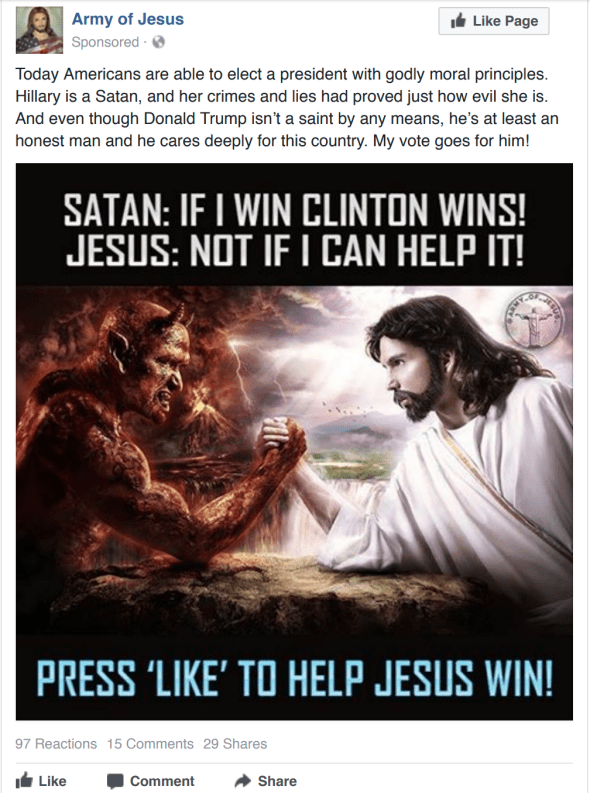 In a study published by Stanford University’s Graduate School of Business in 2017, researches concluded that “the best estimate of the effects of campaign contact and advertising on Americans’ candidates choices in general elections is zero.” In other words, if you are looking to alter someone’s vote, it is going to take more than slogans, attack ads, and memes to do so. To sum up, any genuine hysteria over Russia’s involvement in the 2016 election is misguided. There is no reason to believe Russia affected the US election in any way of their own volition, nor that they broke any laws. Freedom of speech is a human right, not one reserved for everyone except those who have some distant connection to the Russian government. Any attempts to impact the election were impeded by human nature and far greater influences. And Russian meddling in US affairs is a small price to pay for containing them (or, in my opinion, bullying and threatening them). What should be of far greater concern to all Americans are reactions to the Trump-Russia narrative by individuals, the media, and especially the US government. Sanctions against Russia will harm the Russian people and strengthen it’s government. Already suffering from a lackluster economy, sanctions will further thin out their opportunities. On a global scale, sanctions and other barriers to trade create an invisible domino effect that hits sectors of economic activity around the world too. Growing economic anxiety and economic hostility from NATO combined with a global media that paints Trump as Russia’s lapdog will inevitably guide the Russian people deeper into the protecting arms of Vladimir Putin. Instead of making peace and harmony with Russia more difficult, we should accept the minor consequences of containing Russia, or be done with NATO and leave Russia be. The men who fought off a bullying foreign nation to found the United States of America would have preferred the latter option.